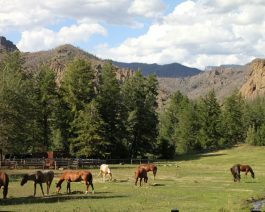 Located in the beautiful Shoshone National Forest, the UXU Ranch offers week-long stays that can be as busy or as relaxing as you like. Choose from horseback riding, Yellowstone tours, guided fly fishing, pack trips, river rafting, cookouts, or just napping in a hammock. Enjoy the Rocky Mountain Gourmet food, wine and spirits. Open May-October.